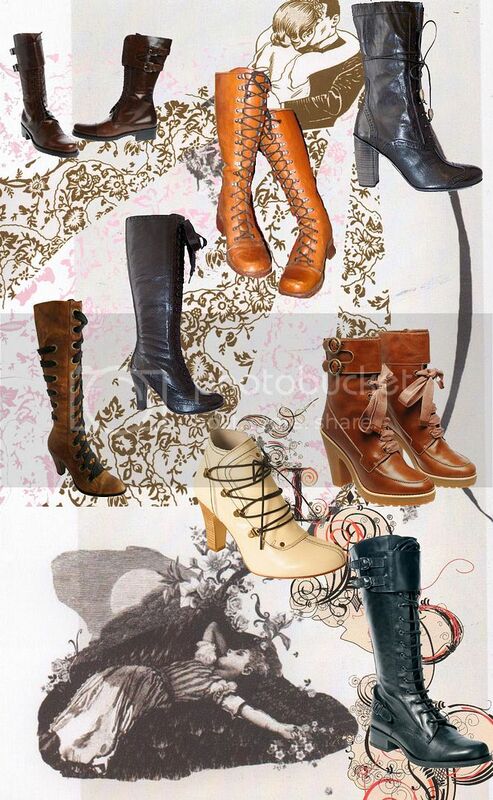 Last winter it was all about the Victoriana lace-up boots. This year, lace-up boots get a lot tougher and a bit rough and tumble. I’m convinced boots are made for stomping this year, not walking. Yet, even though they’re hard-wearing and ‘gritty’, I still want to set a contrast by pairing them with a silk crepe dress or a trailing tulle skirt. It’s like the girly girl who thinks she’s tougher because she put on a pair of combat boots but then gives the game away by wearing them with a pretty floral dress. this is creepy because i just bought those marc jacobs boots and today ordered some cheap flat knee high lace-up’s off zappos.com. im planning so many fall outfits already. thick ribbed tights and those boots. yay. the psychology of the tough/femme boot is so interesting to me….. I really love little deep-v ankle booties actually. Like Renaissance jester shoes or something… I was never a big boot wearer but this fall I’m strangely attracted to the tougher boots annnnddd the ankle booties. Anthropologie has a nice selection—and sometimes affordable! I told my friend to buy the Victorian, witch boots last year…Those will definitely still be superwick for this fall. Paired with black….ahhh! my heart beats faster…. I absolutely love the Marc by Marc Jacobs lace-ups.